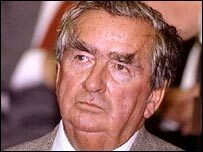 Britain does not need nuclear weapons any longer, former Defence Secretary Denis Healey has said. Lord Healey, who played a key role in maintaining Polaris in the 1960s, said the only case for nuclear weapons now was political, not military. "Nuclear weapons are infinitely less important in our foreign policy than they were in the days of the Cold War," he told BBC News 24. 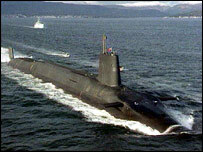 A decision on renewing Trident nuclear weapons will be made later this year. Tony Blair says he favours replacing or renewing Trident and Gordon Brown has also signalled he wants to do the same. Lord Healey supports Mr Brown's hopes of becoming prime minister but believes he is wrong on Trident. "I don't think we need nuclear weapons any longer," he told Straight Talk with Andrew Neil. Nuclear weapons were infinitely less important in our foreign policy than they were in the days of the Cold War, he said. Lord Healey was asked if he thought Britain should stop being a nuclear power in the 21st Century. He replied: "I think the only case is really a political one. I think the military case now for nuclear weapons has gone. "But there is a case for having them partly because we can have a little more influence than we otherwise would have in Washington, and partly to not leave France as the only European country with nuclear weapons." He said he was not in a rush to get rid of Britain's nuclear weapons "but I wouldn't spend a lot of money on Trident and there are plenty of other ways of delivering nuclear weapons". Lord Healey also said Mr Blair should have stepped down "much earlier". "Harold [Wilson] had the sense to go when, you know, he knew he was getting past it, and Tony hasn't had that sense, which is a great shame," he said. The former chancellor said Mr Brown would probably spend more money on social issues than Mr Blair if he went into No 10. "I think he'll give a much more coherent feel to the country about what the Labour Party is for," he said. "He will concentrate on issues which are central I think to Labour thinking and, as a personality, I think people will find him very impressive." BBC Straight Talk with Andrew Neil is broadcast at 0430 BST, 1030, 1530 and 2130 on Saturday and 0130, 1430 and 2130 on Sunday.